Yoga: A leading health journal on Yoga suggests that not only does this age old combination of exercises and meditation bring a lot of stamina to the body it does a lot for the bone mass as well. Women reported considerable increase in spine mass after following a 15-day yoga routine comprising of a variety of poses. Dance: If you like dancing, please start doing it as a routine activity. Make your exercise session more exciting by trying high-energy dance forms like Lindy Hop, Tango, and a few others. All these lead to increased blood flow into the cardiovascular system, thereby, promoting better bone health. Tennis & Other Racquet Sports: All that running and swinging of racquets actually work as quite an apt exercise to keep your body in good shape. These sports allow you to keep both the hips and arms in function and promote better bone health in the pelvic area. Biking & Walking: These are 2 terrific workouts that offer you good scope to inhale more oxygen and contribute towards better bone health. Both of these activities are focused primarily on losing the belly and thigh fat and making the hip bones stronger. Such is the marvel of exercising and working out in different modes! All these bone health stimulating activities help you have an agile body. 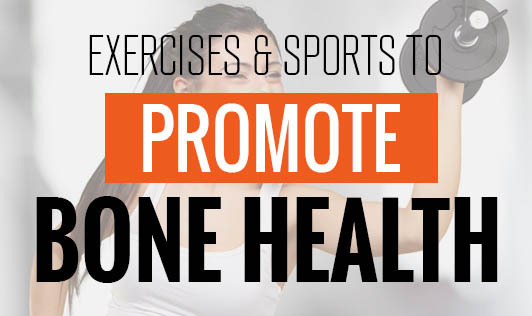 So, include these activities right away in your fitness regimen to enjoy their benefits for the years to come.